Sister Marie Isabelle Tchang, of the Sisters of St. Paul de Chartres, passed away peacefully at St. Paul’s Hospital on 26 December 2018 after a long illness. She was 98-years-old and had been a religious for 67 years. She began teaching at St. Paul’s Convent School and in 1961, after seven years at the Secondary Section, she was appointed principal of St. Charles School, a primary school in Kennedy Town, where most of the pupils were refugees and immigrants from mainland China. In 1969 the congregation’s General Council in Rome appointed Sister Tchang as the seventh provincial superior of Hong Kong and Taiwan. She became the first Chinese sister to assume the leadership post of the Hong Kong Province. Modest and unassuming, and always ready with a smile, she proved equal to the task and responsibilities thrust upon her. Her term was marked by various major accomplishments, which today continue to benefit not only the congregation but also Hong Kong in general. 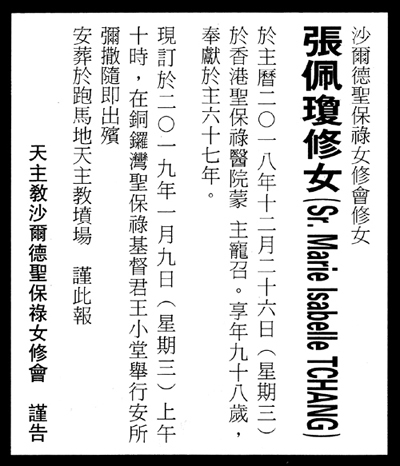 She oversaw and directed, among others, the opening of the Commercial Section at St. Paul’s Secondary School in Happy Valley (now closed), the Nursing School at St. Teresa’s Hospital, St. Paul’s School (Lam Tin), a clinic in Taipo, which was later turned into a nursery school, St. Paul’s Convent, the former New Wing of St. Paul’s Hospital (now replaced by a new block), and more. Responding to the needs of the times, she had the nursery in Causeway Bay changed to a nursery school and the orphanage to a kindergarten. The years following her stint as provincial superior were spent as a missionary in Taiwan. She continued serving for 28 years, as a superior, in charge of boarders, nurses, hospital auxiliary services, and doing pastoral ministry. Finally in 2009, at the age of 88, when old age and illness began to take its toll, she retired to Hong Kong. A funeral Mass is to be celebrated at Christ the King Chapel, Causeway Bay, on Wednesday, 9 January at 10am, followed by burial at St. Michael’s Catholic Cemetery, Happy Valley.